The 1940 United States presidential election in New York took place on November 5, 1940. All contemporary 48 states were part of the 1940 United States presidential election. New York voters chose 47 electors to the Electoral College, which selected the president and vice president. 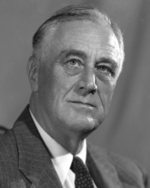 New York was won by incumbent Democratic President Franklin D. Roosevelt of New York, who was running against Republican businessman Wendell Willkie of Indiana. Roosevelt ran with incumbent Vice President Henry A. Wallace of Iowa, and Willkie ran with Senator Charles L. McNary of Oregon. A former Governor of New York who had easily carried the state in his previous two presidential campaigns, Franklin Roosevelt again won New York State in 1940, but by a much closer margin. Roosevelt took 51.50% of the vote versus Wendell Willkie's 47.95%, a margin of 3.55%. New York weighed in for this election as 6% more Republican than the national average. The presidential election of 1940 was a very partisan election for New York, with more than 99.6% of the electorate casting votes for either the Democratic Party or the Republican. 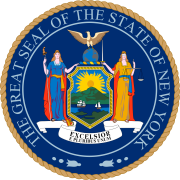 In typical form for the time, the highly populated centers of New York City, Albany, Buffalo, and Rochester voted primarily Democratic, while the majority of smaller counties in New York turned out for Willkie as the Republican candidate. Much of Roosevelt's margin of victory was provided by his dominance in New York City. Roosevelt took over 60% of the vote in Manhattan, Brooklyn, and the Bronx and decisively won New York City as a whole. However the boroughs of Queens and Staten Island flipped to the Republican side in 1940 after voting for FDR in 1932 and 1936, a major contributing factor to why the race was much closer than the 20-point margin FDR had won the state by in 1936. This page was last edited on 16 January 2019, at 14:30 (UTC).